Bye boycotts, carrotmobs are cooler. Forget boycotts. 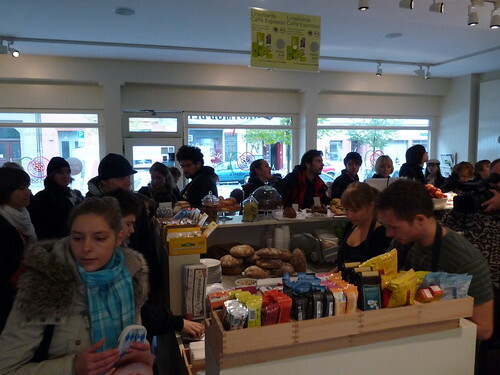 Over the weekend some Berliners queued, bought and chomped their way through a restaurant as part of a new movement to foster a greener environment. Carrotmobs is a relatively new wave of environmental activism that spreading quickly in Germany. The concept is simple – and best phrased by TIME magazine: Instead of steering clear of environmentally backward stores, why not reward businesses with mass purchases if they promise to use some of the money to get greener? Put simply, it’s a reverse boycott. Eve and Adam’s was the participating store in Berlin’s second carrotmob. The restaurant pledged to donate 45 percent of their profits that day into making their shop more energy efficient and hence reduce their carbon footprint. The theme this round: WIR STUERMEN DEN HEISSESTEN IMBISS IN MITTE – which translates literally into “We conquer the hottest diner in Berlin Mitte“, Berlin Mitte being one of the city’s well-known district/borough around the famous Brandenburg Gate. Berliner and many north Germans call their boroughs in a city ‘Kiez’. “Mein Kiz” means “my ‘hood”. Some 500 turned up for the event and there was a good buzz on Twitter. Several bloggers including Hamburg-based Henning thought the concept was “an extremely clever idea, which should be supported”. Organizers hailed the event as a resounding success and reported a total amount of €2334.34 (about US$3,500) spent at the store during the even – €300 more than the first carrotmob held in June. That works out to about just under US$1,600 that the store will set aside to make its business more green. The restaurant too made its largest ever turnover that day, according to Max Patzig, who tweeted on his page. 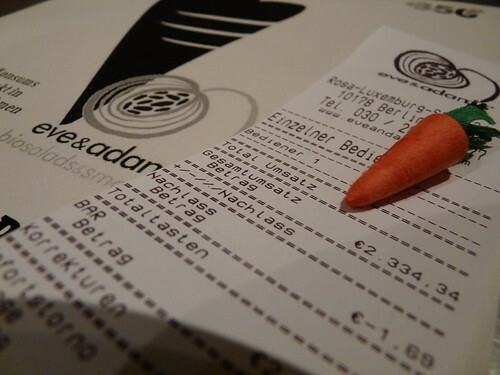 The first carrotmob in Berlin held earlier in June reeled about US$1,000 – the grocery store, Spätverkauf: Multikulti, only committed 35 percent of the day’s profits – and was spent on items such as energy-efficient light bulbs and a thermal protector. That in effect helps save the grocer 1454 kWh of electricity per year, and a reduction of 1152 kilograms of CO2. It’s not clear at this point exactly how Eve and Adam’s will spend the money. Similar carrotmobs were also held in Munich and Bielefeld within the past couple of weeks. “Traditional activism revolves around conflict,” Schulkin told TIME magazine. “Boycotting, protesting, lawsuits — it’s about going into attack mode,” says the former Googler and onetime game developer. “What’s unique about a Carrotmob is that there are no enemies.” The focus is on positive cooperation, using the power of the casual consumer to help save the planet. Out of the total number of carrotmobs conducted, nearly half were done in Europe though. It’s little surprise given that the Europeans – particularly the Germans – have long seen to be more conscious of the environment. An American college tutor who grew up in Germany wrote on his site saying that environmentalism is much stronger, if more abstract, in Germany. Environmentalism in the US is often very down-to-earth: getting industry to clean up a certain toxic waste site, protecting a particular endangered species, or preventing a particular piece of land from being developed, he writes. Carrotmob Berlin #2 from Andreas Förster on Vimeo. Do you think this new movement will have harder bite in environmentalism? What would work in Germany that might not work here in the US when combating climate change? This entry was posted in Culture, German and tagged consumer, Environment, environmentalism, Global Warming, green, shoppers. Thanks for visiting our site. Please do direct some of your friends to this site if its possible. Think its a very interesting topic. Cheers! Thanks for you comment dude. Yea, I think the concept involves bidding. The business that will be most willing to donate the highest proportion of their takings will be selected by the environmentalists. In return, as you mentioned, the biz does get instant windfall for that day and lots of publicity esp on social media since carrotmobs work pretty much through social media outlets. Something for you PR people to think about? It’s a cool idea, though I can’t help but wonder how these environmentalists determine which shop to patronise. It’s almost like an instant windfall for the shopowner, no? I can see this working out in the long run as something that big supermarket chains do (i.e. we’ll donate 50% of today’s takings to improving our green infrastructure), but not as a ground-up activity. Loved the story though – keep ’em coming Derrick!